Sharp advertises the XR-10X as the perfect multimedia projector for the classroom or the conference room and delivers it at price that no major brand currently touches. With a 2000 Lumen output and a native 1024 x 768 resolution, the MSRP of $1500 US seems competitive but the street price is nicely below $1000 and that brings up some more interesting uses. Home theater on the cheap? Replacement for that old computer monitor? Steal? Let’s find out. The XR-10X is a single chip DLP (Digital Light Processor) projector. DLP technology competes with LCD based projectors from the low end of the market to the higher end. While there are pundits on both sides of the isle (along with very good projectors) I favor DLP projectors due to their bright, vibrant output. Dollar for dollar they tend to out shine and out punch LCD projectors. 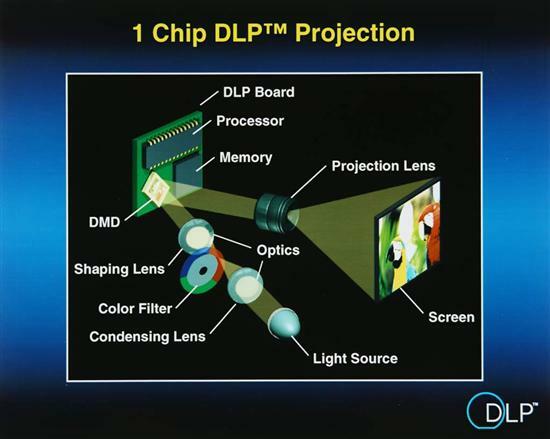 The above image (stolen borrowed from Texas Instruments) shows how the single chip projectors work. At the heart of any DLP based display is a Digital Micromirror Device (DMD), an innovation from Texas Instraments. This is essentially a grid of tiny mirrors that can be tilled thousands of times per second. This mechanism is used to selectively reflect light either to your screen or traps it inside the box. In a single-chip DLP projector (more expensive three chip models are also available) the three primary colors are created using a color wheel. Synchronizing nearly eight-hundred thousand mirrors and a rapidly spinning wheel is not simple task and gets performed by another Texas Instruments chip. Note of caution: some people complain of a rainbow effect when viewing DLP projector such as this. I’ve never noticed it myself nor have any of my associates, but it is probably worth staring at the output of a single-chip DLP project for a few minutes before you buy one just to be safe. 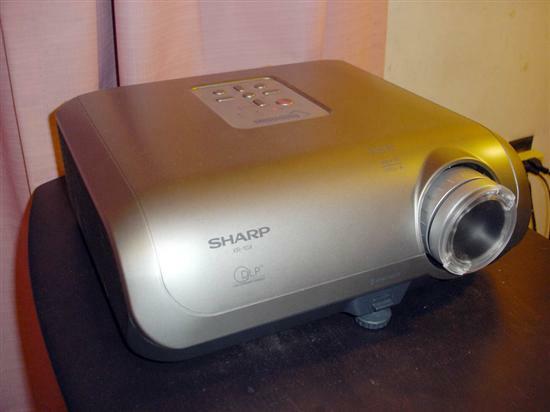 For a budget projector, Sharp throws in a nice extra, a component cable that works with the VGA style plug on the projector (otherwise a $49.99 value). In addition you get the projector, lens cap, remote, power cable, batteries, and a VGA cable. Defiantly happy to see that they included the two cables I need (some reason I don’t have a collection of VGA cables, unlike just about every other type of cable).